Are these the 5 best Tottenham goals so far this 2015/16 season? | The Transfer Tavern | Where football transfer rumours fly or die! Are these the 5 best Tottenham goals so far this 2015/16 season? 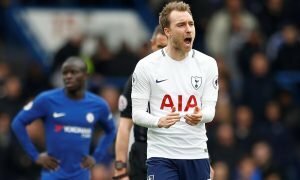 At the time of writing, Mauricio Pochettino’s Tottenham Hotspur had lost the second fewest number of games in the entire Premier League (2) behind Leicester City and were placed fourth in those sought-after Champions League qualification places. Doing a great job with Spurs this season, given the flair and verve Tottenham are playing with, not to mention the fact Chelsea have dropped off massively this term, there is the overriding feeling that 2015/16 is the season Spurs finally get back into the Champions League. Working with a tight-knit squad, the benefits of doing so are there for all to see with the Tottenham line-up rarely changing by huge proportions each week with players knowing their roles well. The big criticism of Tottenham so far this season is that they’ve drawn too many games (8) and if these could’ve been turned into wins, the club would’ve been right up there. Nine points behind Leicester City prior to yesterday’s Boxing Day fixtures, there’s no reaason for optimistic Tottenham fans to think that they’re in the title race yet, let alone the top four battle alone given their new found resilience. Tottenham bought well in the summer with Toby Alderweireld and Dele Alli proving inspirational signings not to mention Heung-Min Son and Clinton N’Jie showing promise here and there. But given we’re around the half way point in the season right now, we’re taking this moment to devise a list of Spurs’ five best goals scored so far this campaign. Click on the image below to reveal the five best Tottenham goals so far this 2015/16 season.